Guess Who’s Coming To Our Special Dinner? We’re between the Friday AM and Saturday AM dots. That’s far enough inland that the winds should be only 40 – 70mph or so (!) when the storm gets to us Friday morning. But the local police department put up a map predicting that we’re going to get “historic” rain totals because it’s going to slow down and drag over us for a day or so. I’ll get to see if the new French drains we just had put in are going to work or not. The whole South Carolina coast just got put on evacuation notice. 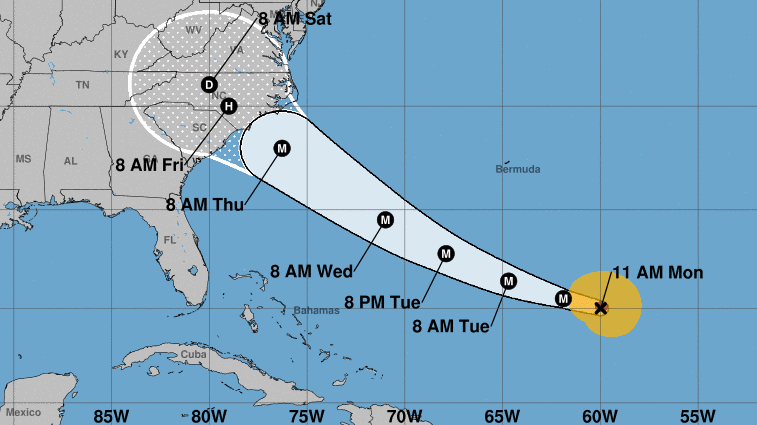 Wilmington NC area schools are already closed for the week. Our friends there are coming up to this area to ride it out. Friday is our 22nd wedding anniversary. I have a special bottle of wine for us to drink in the dark. I think we’ll probably have to pass on the dinner reservations we made for Saturday, too. This entry was posted in Uncategorized on September 10, 2018 by cleek.